My affection for Russell’s Reserve Single Barrel bourbon cannot be overstated. It’s by far my favorite Wild Turkey expression on the retail market today. There’s a number of reasons why, ten of which were covered in a dedicated post last year. I’ve also discussed in greater detail its bottle proof in comparison to its barrel entry proof. That breakdown can be found in my review of Motor Supply Co.’s Russell’s Reserve private selection this past February. But one thing that I’ve yet to examine in detail is chill filtration, or in the case of Russell’s Reserve Single Barrel, the lack of it. Oh, and yes there will be a review today. You can put your hand down now, Timmy. What is chill filtration? Simply put, chill filtration is a common refining process employed by many distilleries as a method for removing residue. Its purpose is to make whiskey more visually appealing – improving clarity by reducing cloudiness. Essentially, it gives whiskey a clean metallic sheen. But does it improve flavor? Well, despite what the industry might want you to believe, it does not. In fact, by most accounts chill filtering has a detrimental impact on flavor. It’s also unnecessary for any whiskey over 86 proof, so why chill filter higher-proof expressions at all? You know what? I’ll refrain from science in this post. Fatty acids, esters and proteins just aren’t my area of expertise. If some technician in a lab coat wants to sit down and explain to me why chill filtration is good for whiskey, then I have but one question for him/her: Why take so much care to ensure that time-tested traditions and Mother Nature work together in harmony only to alter it at the end? A distillery finds choice grains, utilizes proprietary yeast, meticulously ferments and distills, and finally, allows barrels to mature for numerous years (sometimes well over a decade) to create a magnificently natural product. And when it’s reached maturation they take that perfect all-natural product and monkey with it. Why? Shiny stuff. Remember grandma’s homemade ice cream? It was lumpy and runny and melted faster than you could finish it. It was far from the cosmetically perfect ice cream you buy in the freezer section at the grocery store, but damn if it didn’t always taste better. It was an all-natural product – an unrefined beauty. That’s American whiskey before chill filtration. But hold on – just because chill filtration is a common process doesn’t mean it’s always employed. When it comes to Wild Turkey, Russell’s Reserve Single Barrel expressions (bourbon, rye, private selects and standard retail bottles) are never chill filtered. And neither were the last two domestic Master’s Keep releases (17-year and Decades). By association that tells me one thing: Eddie Russell prefers his bourbon non-chill filtered. Today I’ll be reviewing one such non-chill filtered Eddie Russell work of art – a Russell’s Reserve Single Barrel private selection from the fine folks of the Lexington Bourbon Society (special thanks to James Richards). Not to spoil the review, but the flavor is excellent. Thank Gobble it didn’t run through any extra filtration processes. This is 110-proof, single-barrel, Jimmy-school, rickhouse-aged, bona-fide Wild Turkey KSBW. With the exception of minimal dilution, it’s exactly how the Wild Turkey family and Kentucky countryside crafted it (and that’s exactly how I want it). I have a few closing thoughts regarding chill filtration, but I’ll save them for after the tasting. In the meantime, keep your pitchfork nearby. You might need it in a few minutes. Overall: Truth be told, I can’t tell you how many times I’ve heard from folks claiming their Russell’s Reserve Single Barrel selection is the best ever – this one is no exception. I get it. Selecting barrels at Wild Turkey is no doubt an amazing experience and I’m sure the thrill of that visit adds to the satisfaction of one’s pick. But for me it all comes down to how it tastes in my glass, at my house, in my own precious time. In the case of Lexington Bourbon Society’s “Final Pour,” the praise is indisputably well deserved. This is one helluva Russell’s Reserve Single Barrel. There’s loads of complex baking spice interwoven with honey-maple, ripe cherries, and citrus fruit. The herbal spice you so often get with Russell’s Reserve SiB is somewhat dialed back, though far from absent. If I had to peg its profile in comparison to other Russell’s Reserve private selections, I’d say it falls somewhere between Lincoln Road’s #17-990 and Motor Supply Co.’s #17-118. Not quite the level of herbal spice as #17-990; not quite the old-timey country store vibe of #17-118. But overall, “Final Pour” is notably well balanced and incredibly easy to sip. While I’m careful to vary my bottle lineups and give all of my Turkeys attention, this one keeps popping up in rotation. I think that says something – something like, I should’ve secured a backup. I’m tired of whiskey losing its reveries. I want the fatty acids, esters, proteins, and tannins. If a producer wants to chill filter 80-proof whiskey, fine. I don’t really drink it anyway and when I do it’s in Coke or ginger, so go for it. But for everything else, please bypass the chill filtration. In many ways it’s a virtual slap in the face of the farmers, distillers, and fell oak trees. Above 86-proof, there’s simply no reason for it anyway. But you don’t have to take my word for it. Just Google it. Ask around. Hell, ask Eddie Russell. I’m sure he’ll give it to you straight. And that brings me to my final point. 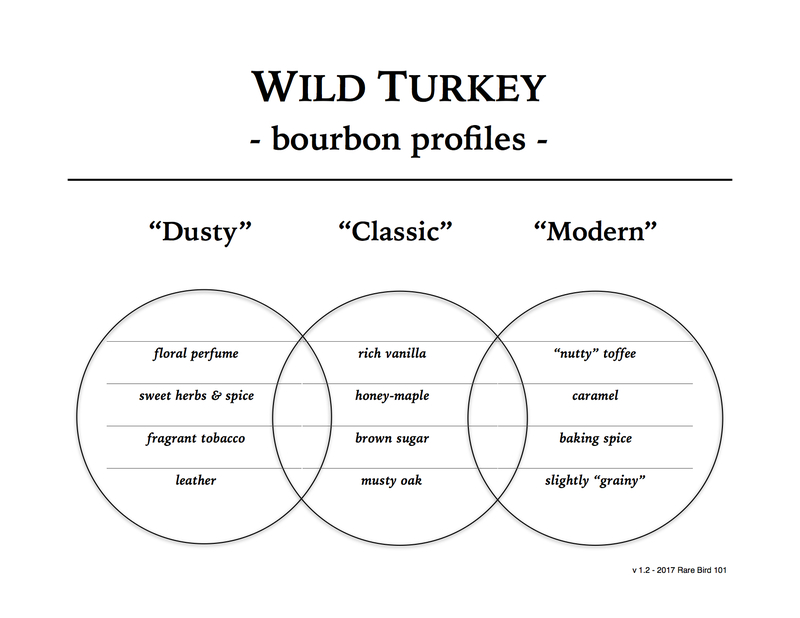 Take a look at the highest-rated modern Wild Turkey expressions on this blog. See a common thread? They’re all non-chill filtered: Master’s Keep (domestic), numerous Russell’s Reserve Single Barrel bottles (bourbon and rye), and both Whisky Jewbilee releases. Now, how many modern Wild Turkey expressions do you find with ratings above 3.5/5 that are chill-filtered? Maybe a rare Kentucky Spirit selection … maybe. I think that speaks for itself. Sure, I’m but one person and I can only offer a single subjective opinion. At the same time, I’ve sipped my share of Turkey. I’m not certain who at Wild Turkey or Campari is keeping chill filtration for higher-proof expressions in place. I don’t think it’s Jimmy or Eddie. If so, why would they ensure their choice releases are NCF? So, to whomever that individual or group of individuals may be – with all due respect, please let it go. Please let my Wild Turkey have its reveries. Wild Turkey 101 (bourbon and rye), Rare Breed, Kentucky Spirit, Russell’s Reserve 10-year, Russell’s Reserve 6-year Rye, even exports like the 8-year and 13-year – none of those whiskeys require chill filtration. Please let them stand naturally. I promise if you take this request to heart – give consumers just one of these expressions as an NCF trial run – you’ll see an overwhelming positive response. I’m sure of it. I love the Single Barrel: I’ve gone through three this year. One was a bit off (I guess it happens with SB’s), one was really excellent, and the second was one of the best bourbons I’ve ever had. It’s always on my self. Same here. I always have a bottle open. They typically range from “very good” to “holy crap this is fantastic”. You’re right. Single barrels are always hit or miss by nature, but in general (with RRSiB) the ceiling is high but the floor is far from low! Amen on chill filtration. The more RRSiB I drink, the more I love it for the mouth feel that chill filtration robs from the experience. Hey, the bourbon industry has been known to respond to demands (somewhat), look at the boom of barrel proof options. Now its time they dig even deeper. NCF is the new barrel proof. Give us what we want! I saw that. Very cool and I’m looking forward to it!